As you take a fall hike in Canyon Country you might be attracted by numerous bits of pink/purple at the tips of outstretched stems. Perhaps you stop often at plants but cannot find any open flowers. Since the flowers are so numerous, there could be quite a show; you plan a trip to the same area in a few weeks. An hour later down the trail something prompts you to take one last close look at the flower, and you are surprised to find that many of the flowers on this plant are open. You now realize that most of the flowers you saw all day long were open. A close examination may even show that a number of the lower flowers have already gone to seed. Cordylanthus wrightii surprises us -- as all plants do if we look carefully. The small green arched crown shelters hairy stamens and between the tip of the arch and the top of the pink there is a very small opening for the pollinators -- small insects. Cordylanthus wrightii just does not open wide. 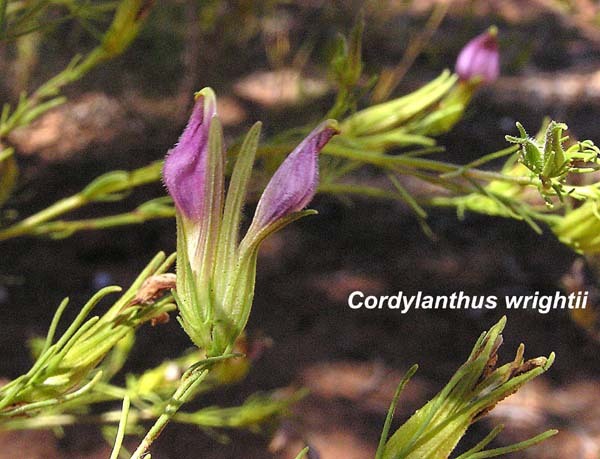 Cordylanthus wrightii commonly grows from 10 to 30 inches tall, branches often, and has very fine leaves that are short and often nearly clasping the stem. Lower leaves wither as the plant grows. Where you find one plant, you may very well find hundreds. Greek gives us both "cordyl", "club" and "anthus", "flower". Charles Wright was a trusted and successful Southwest plant collector for Asa Gray and John Torrey.